Being stuck on an aeroplane for hours on end can take its toll on even the most frequent flyers. But long haul business flights don’t need to be an endlessly uncomfortable experience. With the addition of a few value-add items and some strategic packing, you’ll be able to maximise both your comfort and your productivity. Here are some of our favourite long haul flights tips and tricks. For some of us, it’s difficult to even contemplate getting any sleep on a long haul flight, however, there are a few tips you can take on board that just might make the business of getting some shut-eye a little easier. Firstly, arm yourself with a few travel gadgets. A decent travel pillow, an eye mask and ear plugs, while not the hottest accessories out there, will block out light and sound, and may just help you get comfortable enough to sleep. Eye masks, in particular, can also help you to avoid jet lag. Light affects our circadian rhythm, which is our 24-hour internal clock that cycles between sleepiness and alertness at regular intervals, and blocking out light can mentally prepare you for sleep. Lumbar support like a pillow or blanket wedged behind your lower back can also help keep your spine in its natural ‘S’ shape (as opposed to the C-shape design of aircraft seats), and assist with comfort levels. Speaking of seats, make sure you book a seat that’s situated away from bulkheads, in front of exit rows or seats near the toilets as they generally get a lot of traffic. Window seats will give you a solid wall to rest your head upon (and you won’t be disturbed by passing food trolleys), and if you sleep on the right side of the bed, book a seat on the right side of the plane so you’re mimicking your sleep patterns at home. Seats by the plane’s wing are said to encounter less turbulence since they’re closer to the aircraft’s centre of gravity, and make sure you take advantage of upgrades if you can – booking classes have different perks and can be the difference between a decent rest and no sleep at all! The roar of a plane’s engine is not the most comfortable sound in the world, particularly if you’re trying to get some rest, so invest in a set of earplugs or noise-cancelling headphones to block out annoyances, and consider downloading some meditation tunes to really help you relax. Dehydration due to super-high altitudes and recycled pressurized air is one of the worst parts of long haul business flights, so counteract it by packing a super-hydrating moisturizer, a mineral facial spray and a decent lip balm as well. Another way of surviving long haul flights is to undertake a little exercise. Try and get out of your seat regularly, and if compression socks aren’t your thing, many airlines recommend in-seat exercises for three or four minutes every hour. They include lifting your feet off the ground and rotating them around in circles, rolling your shoulders forwards and backwards, or anything that keeps the blood flowing really! A fairly obvious tip to ensure your long haul business flight is a little more bearable is to keep yourself entertained. 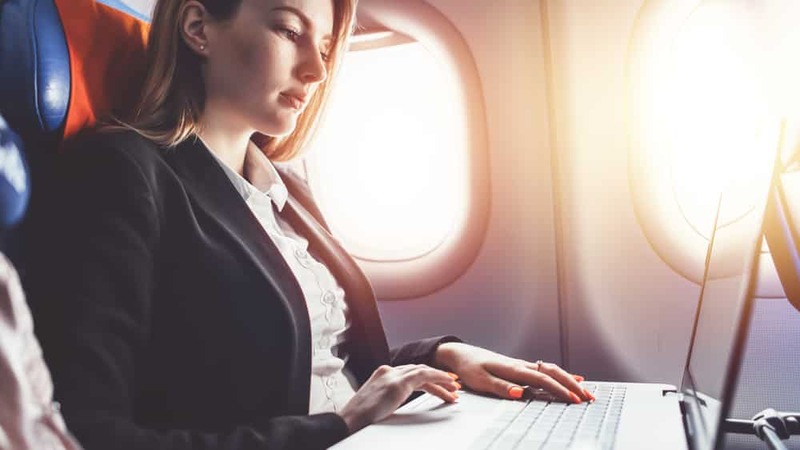 Yes, there are in-flight movies, but if you’re a frequent business traveller you may have limited options, so board pre-prepped with downloads of your favourite movies and TV shows on your tablet. Books and E-readers can also help pass the time as can digital games, and if you’re a music aficionado, load up your phone! And make sure all your devices are fully charged before you board – there’s nothing more frustrating than loading up a much-anticipated entertainment option and having your device run out of juice before you get to enjoy it. Devices that can be charged on the same charger are even better, because they mean you’ll have less weight in your luggage! According to experts, food is harder to digest in the air, so try and resist the urge to eat too much when flying, particularly when it comes to carb-laden meals. Snacking is an ideal way to keep the hunger pangs at bay, particularly if you choose foods that are high in protein (like nuts or crackers and cheese), which will keep you feeling full for longer. Avoiding coffee, keeping your alcohol intake to a minimum and most importantly, staying hydrated, are all handy ways to help you avoid jetlag. Air travel is incredibly dehydrating, so drink as much water as you can as often as you can throughout the entire flight. Another valuable overseas flight tip is to wear comfortable clothing that is loose fitting, and to wear layers that can be added and removed. Long haul flights can mean the temperature can go from freezing to overly hot and then back again, so layering your clothing will allow you to regulate your body’s temperature and maintain your comfort levels. Enjoy the flight! After a comfortable ride home after a long haul flight? CitiCar has all your business travel needs covered with our range of chauffeured cars and shuttles! Get in touch today on 1300 661 119.